Mouse anti Human, Mouse, Rat MART-1 M2-9E3. Product is tested for Western blot / Immunoblot, Immunoprecipitation, Immunocytochemistry/Immunofluorescence, Flow Cytometry, Frozen Sections, Paraffin Sections. ELISA: Use BSA free Antibody for Coating. Immunoprecipitaion: 0.5-1 µg/500 µg protein lysate. Flow Cytometry: 0.5-1 µg/106 cells. Immunohistochemistry on Frozen and Formalin-Fixed Paraffin Sections: 0.5-1 µg/ml for 30 minutes at RT. Staining of formalin-fixed tissues is enhanced by boiling tissue sections in 10 mM citrate buffer, pH 6.0 for 10-20 min followed by cooling at RT for 20 min. Melan-A also known as MART-1 (Melanoma Antigen Recognize by T cells 1), is an 18 kDa melanocyte differentiation antigen recognized by T cells. Melan-A is expressed in melanosomes and the endoplasmic reticulum. Melan-A is the most widely used marker for identifying malignant melanoma (Campoli, 2012), a highly aggressive and deadly form of skin cancer which may be curable when caught early. Melan-A specific monoclonal antibodies have utility for evaluating suspected melanocyte lesions by immunohistochemistry as they have both high sensitivity (75-92%) and specificity (95-100%) for melanoma (Campoli, 2012, Oshie, 2012). Campoli et al. Mohs Micrographic Surgery for the Treatment of Cutaneous Melanoma. In: Mohs Micrographic Surgery. Nouri K (Editor) 211-223 (2012), DOI: 10.1007/978-1-4471-2152-7. Ohsie et al. 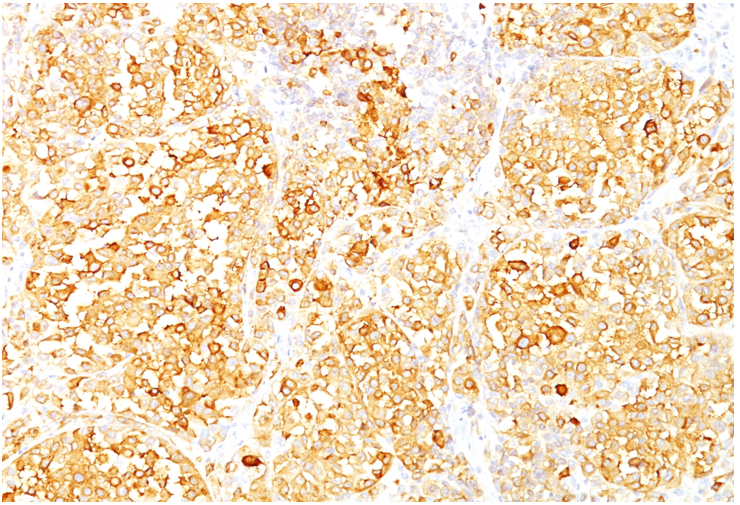 Tissue-Based Protein Biomarkers in Melanoma: Immunohistochemistry: (A) Diagnosis. In Diagnostic and Prognostic Biomarkers and Therapeutic Targets in Melanoma Current Clinical Pathology, Murphy MJ (Editor). 159-176 (2012), 159-176, DOI: 10.1007/978-1-60761-433-3. Collins GR, Essary L, Strauss J, Hino P, Cockerell CJ. Incidentally discovered distant cutaneous metastasis of sacral chordoma: a case with variation in S100 protein expression (compared to the primary tumor) and review of the literature. J Cutan Pathol. 2012 Jun;39(6):637-43. doi: 10.1111/j.1600-0560.2012.01895.x. Epub 2012 Apr 24. PubMed PMID: 22524546. 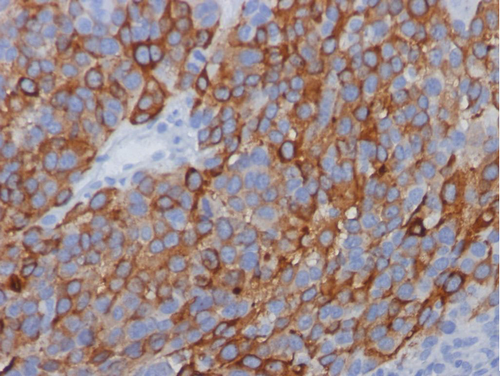 This antibody recognizes a protein doublet of 20-22kDa, identified as MART-1 (Melanoma Antigen Recognized by T cells 1) or Melan-A. It is also a useful positive-marker for angiomyolipomas. It does not stain tumor cells of epithelial, lymphoid, glial, or mesenchymal origin. 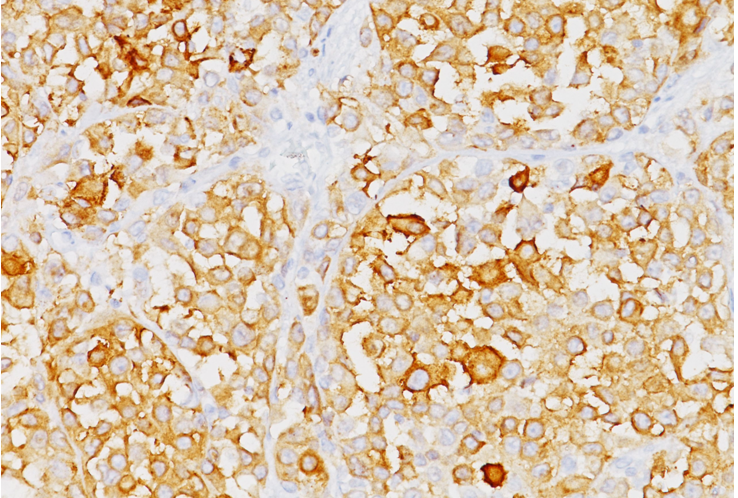 The clone M2-9E3 MART-1 antibody labels melanomas and other tumors showing melanocyte differentiation (Kawakami et al, 1997). 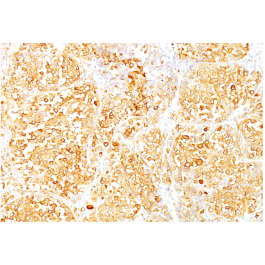 The antibody has been highly characterized, including by Immunohistochemistry, Immunofluorescence, Western blot and Immunoprecipitation, and the specificity of the antibody for Melan-A has also been validated by Melan-A siRNA knockdown (Hoashi et al, 2005). Additionally, the Melan-A antibody has been used in combination with other melanocyte differentiation markers to help confirm or exclude melanocyte histogenesis (Collins, 2012; Mihic-Probst, 2012). It is important to note that Melan-A expression is not restricted to melanoma, and may also be detectable on some other type of tumors (reviewed in Campoli, 2012). The exact eptiope recognized by the Melan-A antibody has not been mapped. However, the Melan-A epitope recognized by this antibody appears to be different than that recognized by the MART-1 antibody clone M2-7C10 (Cat.-No AM32812PU) (Kawakami, 1997). Researchers often use more than one antibody against a given specificity to help follow up and validate results. Hence, it may be useful to use both the Cat.-No AM32812PU and Cat.-No AM32813PU antibodies in parallel to obtain additional information about Melan-A expression.